“The making of single malt whisky is a sort of alchemy, the making of truly great single malt whisky is a form of magic”. There are very few ingredients in our single malt whisky; water and malted barley. What makes them special is simply the quality of the water in Arran, the quality of the barley we select and lastly the skill of the Arran distillers to combine the two. This skill shouldn’t be underestimated. Selecting the right cask, knowing when that cask should be opened or left to mature for a little longer or adding a specific cask finish to enhance the flavour are gifts it takes generations to perfect. Our single malts are our signatures; they are the unique taste of Arran. We hope you enjoy discovering them as much as we enjoyed creating them. 10 The classic expression of Arran – our fresh and unique island style is captured beautifully in our 10 Year Old Single Malt. First released in 2006, this is the flagship Single Malt of our distillery and one that we were very proud to launch to great acclaim. It is without doubt a ‘must have’ in the collection of all Single Malt Whisky enthusiasts. Nose:The initial rush of rich vanilla sweetness gives way to the fruits of slow distillation – kiwi, banana, cantaloupe melon – with just a dusting of cocoa powder. It is undoubtedly complex and yet the aromas are in complete harmony with the malt. Palate: A touch of cinnamon adds a spicy edge to the soft and sweet texture which captivates the palate. The classic Arran citrus notes have rounded with age and reveal new depths of character against a background of sweet oak. Finish: It drifts over the tongue like golden syrup and fades ever so slowly to tempt another sip. This is a beautifully made whisky. 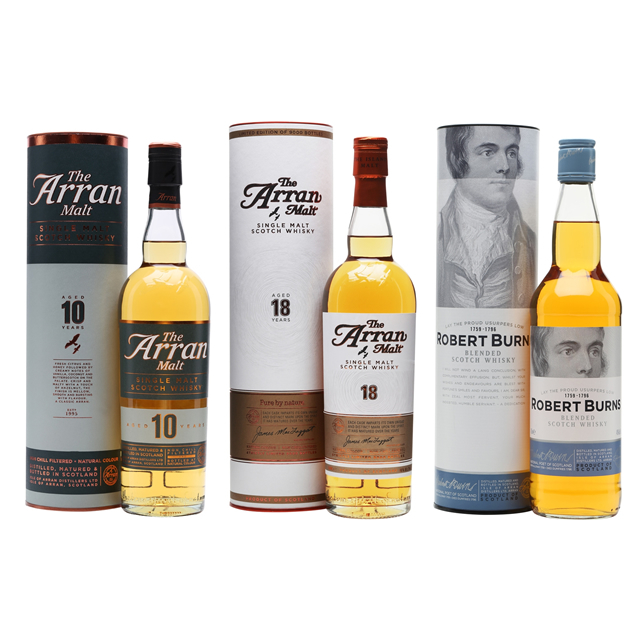 18 This Limited Edition release of The Arran Malt at 18 Years Old has been produced from un-peated malted barley and matured in a selection of the finest ex-Sherry casks. The whisky has not been artificially coloured and has not been chill-filtered at bottling thus retaining the full range of aromas and flavours which typify this unique Island Single Malt. It has been bottled at 46% abv. Only 9,000 bottles of The Arran Malt 18 Years Old have been released worldwide. This is the final bottling in a trilogy of 16, 17 & 18 year-old Arran Malts which celebrated the countdown to this first official release of The Arran Malt as an 18 year-old. The Robert Burns This is an official Arran Single Malt which has been endorsed by The World Robert Burns Federation. Made from approx 70% Bourbon Casks and 30% Sherry Casks, this light aromatic Single Malt is ideal for drinking, prior to or during a meal. Very fresh with no artificial colouring, this beautifully packaged malt is made for easy drinking. Finish: Clean and fresh with an aftertaste of hazelnuts and milk chocolate. A true drop of liquid poetry and the perfect dram with which to toast the Bard!